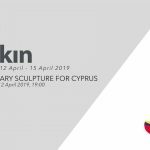 The Arkın Award, organised by Arkin University of Creative Arts and Design in Cyprus (ARUCAD), an international open call for designs for a site-specific permanent work to be founded in an elevated mountain location overlooking the town of Girne (Kyrenia) and the Mediterranean coastline, was opened in August 2018. Over eighty pieces from thirty countries were received and we would like to extend our sincere gratitude to all the artists, designers, sculptors and creative minds from all over the world who submitted works to the award. Six works by Léo Caillard, Maurice Blik, Lotta Blokker, Angela Connor, Steve Anthony and James Scott were selected. The selected works will be exhibited at the Art Rooms gallery in Girne (Kyrenia) between 12th – 15th April, and we would like to extend an invitation to the public for the opening cocktail on 12th of April at 19.00, to everyone to come along and view the excellent submissions.